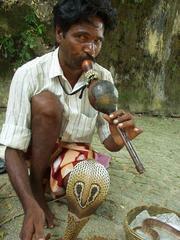 Snake charmer in Fort Cochin, India. The weather in Fort Cochin is Floridian, and the geography mimics the Bay Area. The air is warm and muggy, and the waters are clogged with water hyacinths. On the Eastern bay, analogous to Oakland, is Ernakulam, which is industrial and has large boat loading apparatus that look like the Imperial Walkers from Star Wars; Fort Cochin is a San Franciscan peninsula to the west, which was settled first and has most of the tourist attractions. I found a place to stay in Ernakulam, and took the boat across to Fort Cochin. The boat ride across cost five cents, for a ride in a long wooden boat that holds about forty people, with an inboard diesel engine. Upon arrival, I went first to Addy's Restaurant, which was about a two mile walk from the pier; it got high marks from the guidebook -- something that Addy himself was obviously proud of, since he had xeroxed out the guidebook entry, blown it up several times, and posted it on the door. I walked in, and found that I was the only customer. The owner, Addy, and his friend, Brian, were the only other two people there. I ordered lunch: prawns that had supposedly been caught in the Chinese cantilevered fishing nets that were around the Fort area. A woman went to prepare the food, the owner stepped into a back room, and so I talked to Brian for a while. He seemed like he was well traveled, so I asked him about places to see around India. Did I like trekking and Safaris? I nodded. Ramganya, which was near Corbett Tiger Reserve, was the place to go: there one could hire an elephant and a guide and go looking for tigers. "Usually you go for two or three days, and even then if you see a tiger they consider you lucky," said Brian. 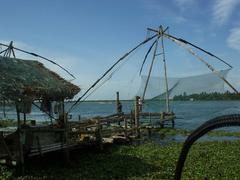 Cantilevered Chinese Fishing nets, Fort Cochin, Kerala. "Probably have lots of cobras there too, huh?" "Yes, king cobras even they have there. Have you seen a king cobra?" "They are about four feet high," Brian held his hand up four feet off the ground, "and if they bite you, you have about one minute to live. They are one of four poisonous snakes in India: there is also the Russell viper, the soft-scaled viper, and the common krait. I used to work for a snake park near Madras, and would catch cobras for them. We'd get ten rupees for each one." 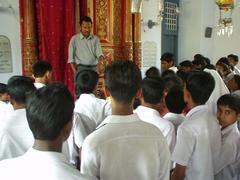 Indian schoolchildren being lectured on Judaism. Brian shook his head and laughed. "No, very small ones. For antivenin." Trevor, the owner, came back (Addy, the restaurants namesake, was his grandmother; her portrait was the only item adorning the walls). "Where are you coming from?" he asked me. "No, I mean before, originally." Right, 'coming from?' means 'where are you from?'. "Chicago, originally, now San Francisco. United States." "Any big events with security in the United States now?" Not so much with security per se, I told him, but George Bush's party now controls Congress, so it seems more likely that we'll invade Iraq now. I explained how that might not be altogether a bad idea, but what with Israel being there and feeling pugnacious, it could get bloody. "And then the Arab states will join in and it will be trouble," added Brian. "But it might be a good thing. Bill Clinton was skimming..." Trevor looked around the room for the rest of the idiom he had started. "He was skimming on the water, he wanted everybody to like him. With George Bush you can see that he in wanting to do the right thing. He is willing to take a side." I related a Time magazine article that had given the United States a report card on various parts of the Afghan campaign. We had done brilliantly in combat, but lagged afterwards in dealing with more civilian tasks. If the United States could only do better at the post-warfare bit, I'd be a little more enthusiastic about this nation-building stuff in Iraq. "It is difficult from the battlefield to make it work," said Trevor. "From your couch or from your house it is easy to say they should have done this or done that, but it's hard to pull off." "I suppose I am being something of a Monday morning quarterback, huh?" By the time I had explained what an American football quarterback is, and that games were on Sunday, my prawns had arrived, and they were straight out of Louisiana: covered in blackening spices, with buggy black eyes on stalks. Brian talked me through taking apart the first one. Most of the time I'm a vegetarian, particularly in the United States. Originally it was from horror at the similarity between my own muscles and those that I was eating: I converted after being a teaching assistant at Eckerd College for vertebrate biology, which involved a great deal of cat dissection, and then coming home for Christmas right after that final and slicing apart Cornish hens; the similarity was a bit much. After a few years, and after reading Fast Food Nation, I'm more inclined to think that perhaps small-scale, grass-fed beef might be morally acceptable, although at this point I doubt I'll eat it myself. The stuff made by the big meat packing conglomerates, IBP and ConAgra, is revolting, where cattle are treated as a manufactured good, illegal immigrants are considered disposable, and the slaughtering line speeds are pushed to the point that feces and beef frequently commingle. At all times, however, I have thought that tearing apart crustaceans was acceptable: here you are forced to confront the fact that you are eating an animal, because you're tearing it apart with your own hands. The combination of beer and decapod innards made me nostalgic for Maryland blue crabs. Trevor turned on the radio and flipped through some stations. "Here we also have American music, for you, eh?" And with that he walked out into the same back room; Clint Black blared out of his stereo. George Bush a good president? Clint Black? Blackened prawns? I checked for a Lone Star flag on the walls, but only the portrait of Trevor's grandmother looked back. Every hotel in India makes you sign in on an imposing two-foot square ledger, with your name, permanent address, and signature. At my hotel in Ernakulam I noticed that the entry above mine was from 56th Street, in Oakland: about a mile and a half from the apartment I had just left. It seemed a bit much to go about asking everyone I saw if they were, in fact, the people from down the street who happened to be in the same remote corner of the world. Fortunately, I brought a UC Berkeley shirt along for just such occasions, and wore it that day. After eating at Addy's, I walked around Fort Cochin and saw the religious monuments: St. Francis's Church, the oldest Christian church in India that is still standing, and the Synagogue of the Cochin Jews, who have been in the area since at least the tenth century, when the King of Malabar granted status on par with being a minor king to a Jew named Joseph Rabban. Today there are less than twenty remaining, due to emigration to Israel, and they are all elders. Within twenty years there will almost certainly be none left. On the boat back to Ernakulam there was a couple, and the woman immediately noticed my shirt. You're from Berkeley? Well, Oakland really. You too, huh? Staying at the Bijus hotel? Me too. Their names were Becky and John, and they were typical well-educated adventurous Bay Area denizens. On the next two days I did the obvious two Kerala tourist things with them, which both turned out quite well: a backwater cruise and a Kathakali theater. The Keralan Backwaters were created by damming for rice paddies, and are fresh ten months of the year and brackish the other two. Many people live there, and we saw many of them on the way out. They were fishing, digging and washing in and near the water. All of them stopped to look at our boat as we passed; half of them waved happy greetings, and the other half looked at us in silence with serious, dark eyes. The first part of the cruise was on a large houseboat, with about twenty people on it, mostly Indians. We visited a village in the backwaters, where we were shown how they carved doors, made cord out of coconut husks (which was not just for illustrative purposes; I have since seen large scale operations of a similar nature on the side of the road), and grew spices. The acre where they grew spices was like a living version of the baking aisle in an American grocery store: turmeric, curry leaf, nutmeg, cardamom, and mace (which is the outer coating of a nutmeg nut) were each shown to us in turn, as well as betel plants, the leaves and nuts of which are used in making pan, a kind of Indian after dinner digestive. After the village, we were rowed in smaller boats that held about ten people each, through waterways of various sizes, from rivers down to canals four feet wide with overhanging branches. I was the frontmost passenger, with the man rowing the boat facing me. He wore only a bright orange lungi and a red cloth on his head; he was wire thin, without an ounce of fat on his body, and his tiny muscles were nevertheless solid, like whipcord. In the three hours that he propelled us, he burped once, laughed once, and otherwise rowed without pause. The ride back from the boats to central Ernakulam was an unpleasant fast forward from the most idyllic, simple village to the worst scenes of unchecked and unzoned modern development. We started in a village where a man hacked coconuts open for us to drink in front of his thatched hut, and then got in the bus we had arrived in and headed home. First there were a few tea stalls with hands of bananas hanging out front, then concrete walls painted with advertisements; motor scooter repair stands with hand painted signs soon gave way to larger glass encased edifices selling furniture and electronics. Finally, we entered Ernakulam proper, which was in full neon bloom, advertising Tom and Jerry pajamas and cell phone plans: "The only thing that covers Kerala better than us is the monsoon". 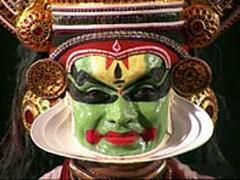 Becky, John and I arranged to meet to go to a Kathakali theater performance the next night. We went to the See India Foundation's show, which the guidebook says "features an extraordinary explanation by PK Devan, who explains the dance's history." I was not disappointed. Part of the show is watching the actors get ready, as they put on layers of thick coconut-oil based paints in vivid colors; there were two at this show, one who was wearing mostly green colors, and another in black and red, with a little paper white tuft on his nose, as are used to cover the bone end of a drumstick. They then went into the wings to finish dressing while Mr. Devan explained extraordinarily. He had a slow, booming voice, with which he introduced two barechested men: a Kathakali drummer with curved drumsticks and white stripes painted on his shoulders, and a dancer without makeup, not one of the two we had seen earlier. The drummer rapped out frenetic beats, and the dancer danced while Mr. Devan tapped together two heavy metal cymbals; this was interleaved with Mr. Devan's drawled explanations of what the dancer was doing. Every vowel dripped ever so slowly out of his mouth. "The Kathakali dancers learn from when they are very young to control their eyes. They can move them up and down." The dancer assumed a crazed false smile and moved his eyes up and down. The dancers eyes moved wildly from side to side. The dancers eyes swerved around in loops. Mr. Devan explained that the dancers have a vocabulary of gestures; they never speak, although bad guys are allowed to grunt and squeal on occasion. He went through a glossary of terms, both concrete and abstract, and the dancer did a thirty second dance expressing each one: fish, love, hate, fear, cobra. The wild, insane grin was always part of the Kathakali guise, modified only slightly to accommodate other emotions as appropriate. The dancer twitched his cheeks to the pulse of the music and stepped broadly about while gesticulating with both arms; he wore long metal spikes on his left hand, like an exotic Freddy Krueger. It was like watching a game of charades, as done by professionals. The final item was "bee at flowers," where the actor made huge flapping motions that settled down to a gentle nectar-sucking movement, with his silvery fingers fluttering by his cheeks. Then came the actual performance. The actors, who had left with just painted faces, returned in full regalia, with huge headdresses and enormous hooped skirts. The green one was a prince, explained Mr. Devan, and the red and black one was a demon, which he pronounced "daymun". The show itself was almost an anticlimax to the explanation; there were three short scenes in which daymun threatened prince, prince threatened daymun, then a brief battle in which the daymun, predictably, lost. The show closed with a long rambling speech from Mr. Devan, touching briefly on Kathakali, but dealing primarily with how the pace of life in India was slow, such that it was acceptable to make long rambling speeches, "because we have the time". He also proposed a theory on the Indian affirmative head-wobble. "Sometimes people ask me why Indians move their head like this." Head wobble. "Of course, nobody knows, but you see, I have an idea. When you move like this" -- he made a short chopping nod -- "it is a conquering gesture. You live in lands where you have to fight cold and snow. In India we have never known this; we are like corn swaying in the breeze, so we move like this." One more wobble.